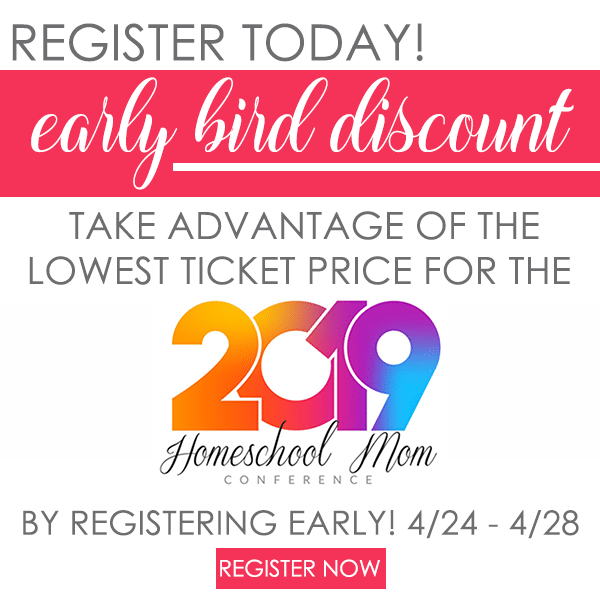 I’ve been homeschooling now since 2005 and I still feel like I’m floundering trying to figure out what works and doesn’t work with my children’s lessons, curriculum, organization, goals, and expectations. Each year brings new family dynamics, challenges and successes. 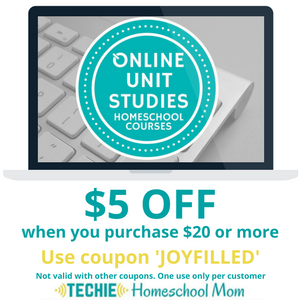 But, despite my struggles as a homeschool mom of 5 children, I am happy to say that I have finally figured out a system to organize our homeschool books that I think is worth sharing. 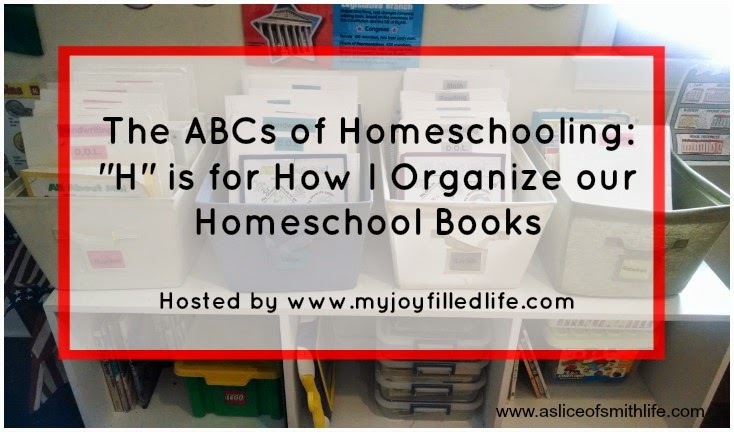 I am participating in the ABCs of Homeschooling hosted by Sarah at My Joy Filled Life and “H” is for how I organize our homeschool books. This post includes affiliate links. 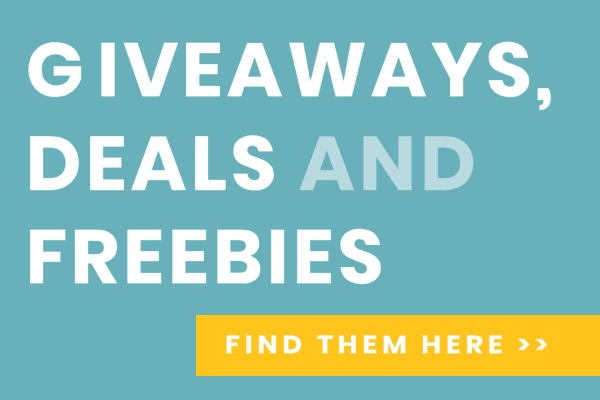 Thanks for your support of this site! Please see my disclosure for more information. Our homeschool room that I am grateful to have is where we store all of our books that we use with our 2014-2015 curriculum. I look at the pictures of our learning space and chuckle since it’s hard to remember that our designated homeschool room was ever that clean! The two items that keep our homeschool books organized even when the rest of the room and my house looks like a tornado came through is BASKETS and BOARDS. 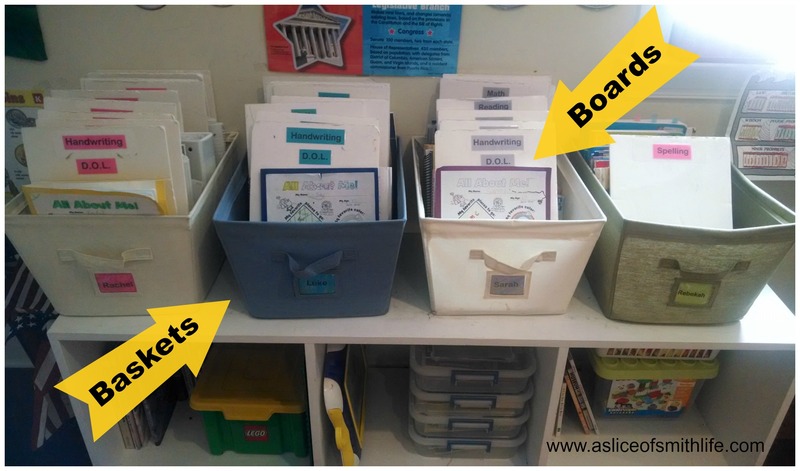 It took me several school years to come up with this organization system and it evolved into what has been working for us for a few years now. It’s simple to implement and saves so much time as books are always easily accessible. Each child gets a basket that I picked up at Wal-Mart or you can order them from Amazon and in each basket are foam boards for each subject. I can’t remember the exact location I found our white boards, but it was probably at a local office supply store. They can also be purchased at Amazon. My husband and I used a X-ACTO knife to cut the boards to size and then labeled each board by subject. Here is a close-up of one of the baskets with boards. I printed out the subject labels on my computer’s Word program and used clear packaging tape to tape them to each board. 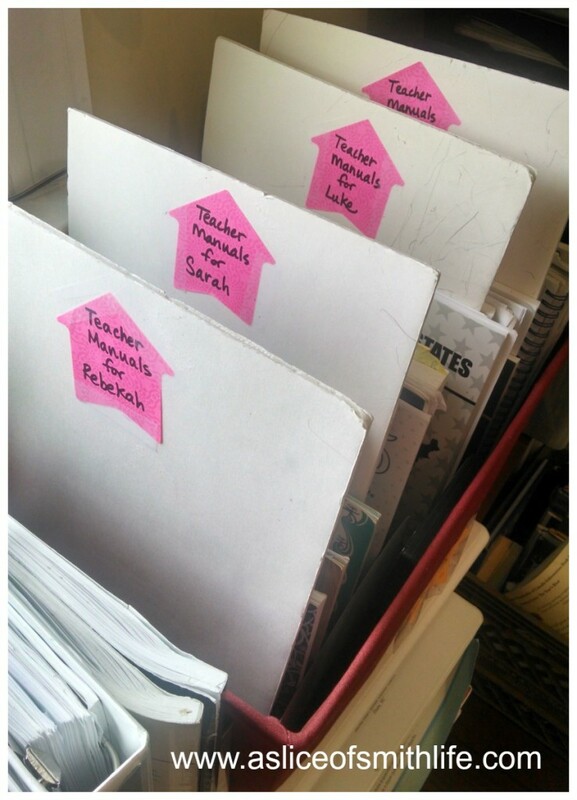 I assigned one color for the subject labels for each of my children as another way to keep things neat. I find for the most part my children keep their baskets tidy because each book has it’s own place in the basket behind it’s own foam board divider. I have used bookshelves and baskets with no foam board dividers in the past and I found my children wasted alot of time hunting for books and papers in the black hole of a disorganized book shelf or basket. 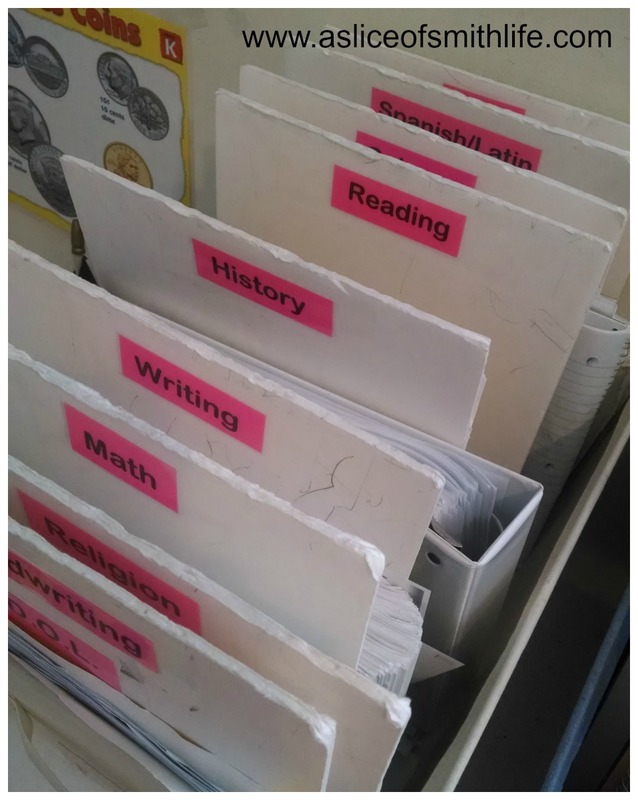 I have a separate basket that holds all my teacher manuals and again the foam boards are used to divide each child’s manuals. This saves me time since now not only can I find the teacher manuals easily, but my children can easily find them and bring them to me if I’m busy. 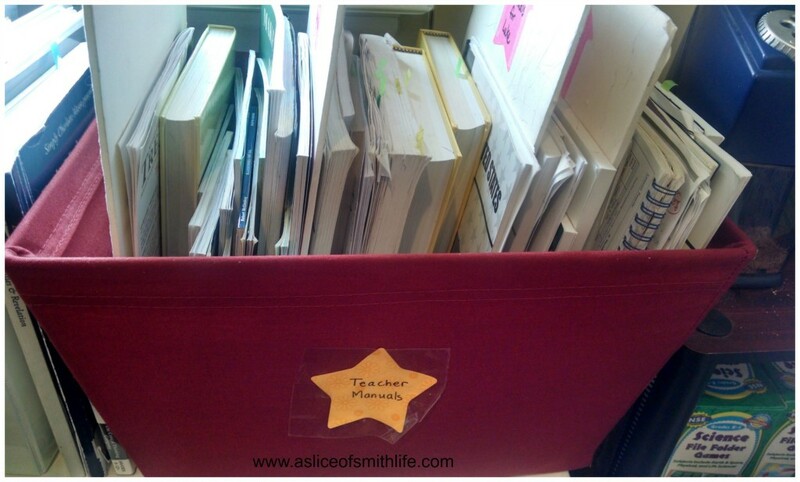 Besides the baskets and boards that I use for homeschool book organization I also use lots and lots of colorful Post-It Tabs to bookmark which page I’m in in teacher manuals, read aloud books, or curriculum books. I really do love my tabs because it saves me time and I don’t have to constantly flip through pages and refer back to lesson plans or guess where we left off. 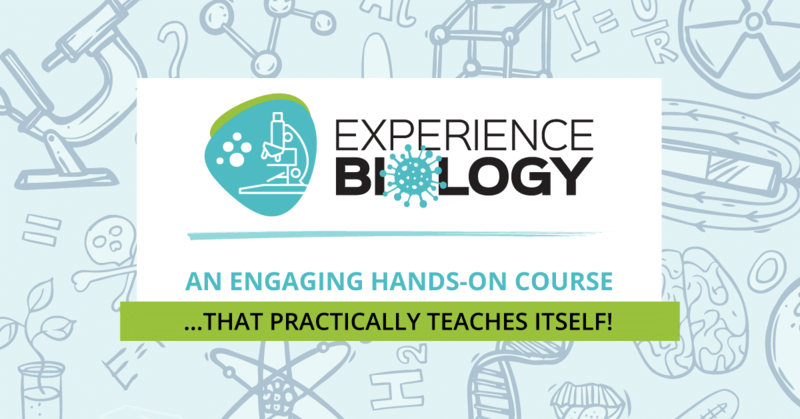 I feel like progress is being made each time I’m able to move a tab to the next lesson. 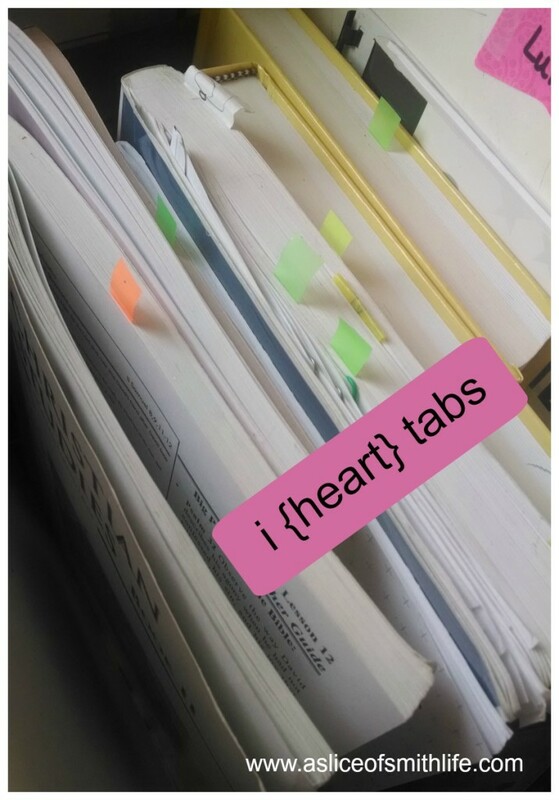 Too often in my homeschool journey, I feel like I go one step forward and two-steps back with learning successes, but with my tabs I can see that progress is being made as each child completes each lesson/page with success. I notice my children also like to tab their books and notebooks to keep themselves organized and to encourage all of us to keep moving forward even when the going gets tough. So do you think baskets and boards would work for your homeschool book organization or a system similar to mine? 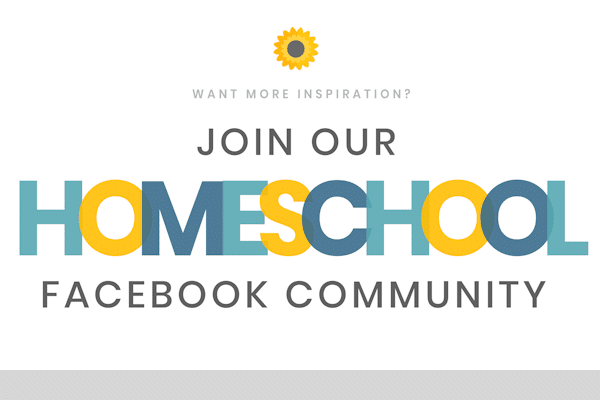 Please share in comments how you organize curriculum in your home. I would love to hear your ideas! 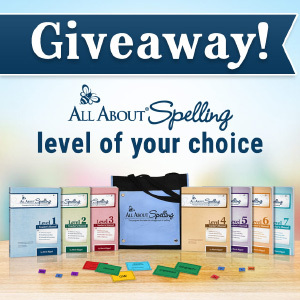 Tracy started blogging in 2010 because she loves sharing her Catholic faith, family and homeschooling journey. Her wonderful husband and 5 blessings keep her on her toes and make life beautiful and busy. When she’s not busy baking cakes for her family or dreaming she had a housekeeper/professional chef or making memories in real life, she enjoys blogging at A Slice of Smith Life. You can follow Tracy on her blog’s Facebook page, A Slice of Smith Life, Pinterest, Google +, and Bloglovin’. Tracy is also a team member at SaintNook, where the Saints are always online! Follow SaintNook on their Facebook page too! Thank you again for allowing me to be a guest on your beautiful blog! It has been great working with you! Have a blessed weekend! Wow! You are so organized! I’ve been trying to think of a way to organize our books a bit better! Thanks for the ideas and inspiration!